We will be meeting Saturday, February 6, from 10-3pm for a mini-retreat type sew in at the Durham Pubic Library in Durham NH - this is a different location than we had originally planned on, but we were seeking a location that would be a little bit bigger and still warm! Please bring your machines, necessary accessories like thread, power cords and foot pedals, etc., as well as your current sewing project! We do not have any specific projects planned to work on, but this will be a great opportunity to make some progress, chat with friends, and get opinions and tips and tricks from other quilters. 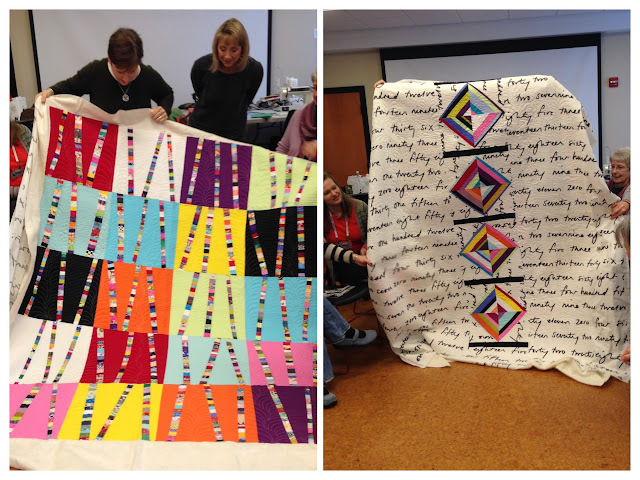 Also, if you are one of the two people who still have jelly roll race quilts with you please bring them to the meeting as we are planning to donate them in February. If you will not be able to attend the meeting please get in touch with Kali at zirklek@gmail.com to arrange a handoff so that they can all be donated at the same time. Our January meeting was held in the Durham NH Public Library meeting room. After business and show and tell we made quilt blocks for the #donateablock2 Charity Drive. We had an update on the QuiltCon 2016 charity quilt. The label will be stitched on this week and the quilt will be sent to Pasadena soon. The blog has undergone some changes recently with more in the works. Click through to explore what we have to offer. We had many great pieces at show and tell. 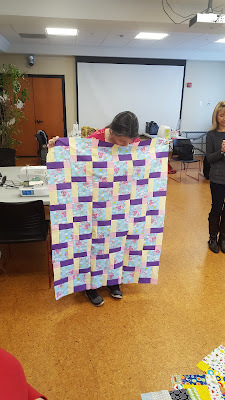 Paula kicked us off with this quilt that she started and finished in December that came from a kit from a quilt shop. Mary showed this table runner that she has been making to give away. Isn't her quilting lovely! 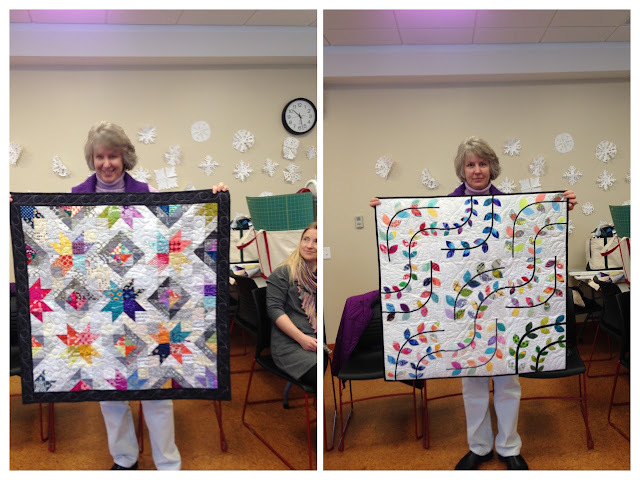 Nancy showed two finished lottery quilts that she made using lottery blocks that she had won from the guild. Laura passed the highfive hand to Paula for her hard work this past year as our hospitality chair. Colleen will be taking over and arranging our snacks for the upcoming year. Laura had two mini quilt tops that she finished, the first one used Amy's Haberdashery Quilt Pattern while the second one used ShapeMoth's pattern for feathers and a self drafted design for the border. Colleen showed off her Bright Birch Trees quilt made using the pattern by Crazy Mom Quilts. This quilt was quilted by Mary and will certainly be nice and cheery for the winter months ahead. It even has a nice surprise on the back! Mary showed this double wedding ring pillow that was to be gifted very shortly. The pillowcase came together despite a number of trials including the need to send her husband to Joann Fabrics for a pillow form – he got the right size and even used a coupon! Jess whipped up this quilt top from scraps made by her recent projects. 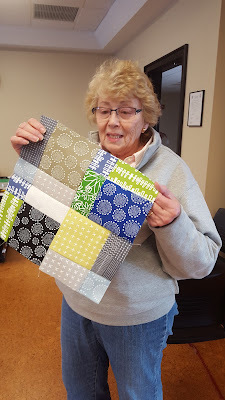 Jane got a head start on our charity sew in with these fun wonky nine patch blocks from some novelty fabrics. We all got to sewing and amassed quite the selection of blocks by the time we were done. These blocks will be donated to #Donateablock2 which is a campaign by Nicola (@hhhomemade on Instagram) to collect blocks to make into quilts for children at Boston Children's Hospital and Great Ormond Street Hospital in London. The charity drive is being sponsored by Karen Lewis Textiles so we purchased some charm packs of her new line, Blueberry Park, with Robert Kaufman to use. One of these was given as a door prize to Laura who had the winning ticket. The February meeting will be held on the 6th - the location is TBD. We will be doing a mini-retreat so bring your WIPs, your sewing machines and any show and tell. Hope to see you there!